Everything is in this kit - except your tools. 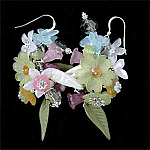 Tarina Tarantino inspired earrings which sell for hundreds of dollars. Make them in one evening - wear them forever. Includes: Base metal components, Lucite, Swarovski Crystals, Pearls and Gemstones! Must know wire - wrap loop technique. There are NO diagrams in the instructions. Instructions come with the kit.